Vitamin C Serum addresses a range of beauty concerns including acne, discoloration, uneven skin texture, and of course, a loss of collagen. 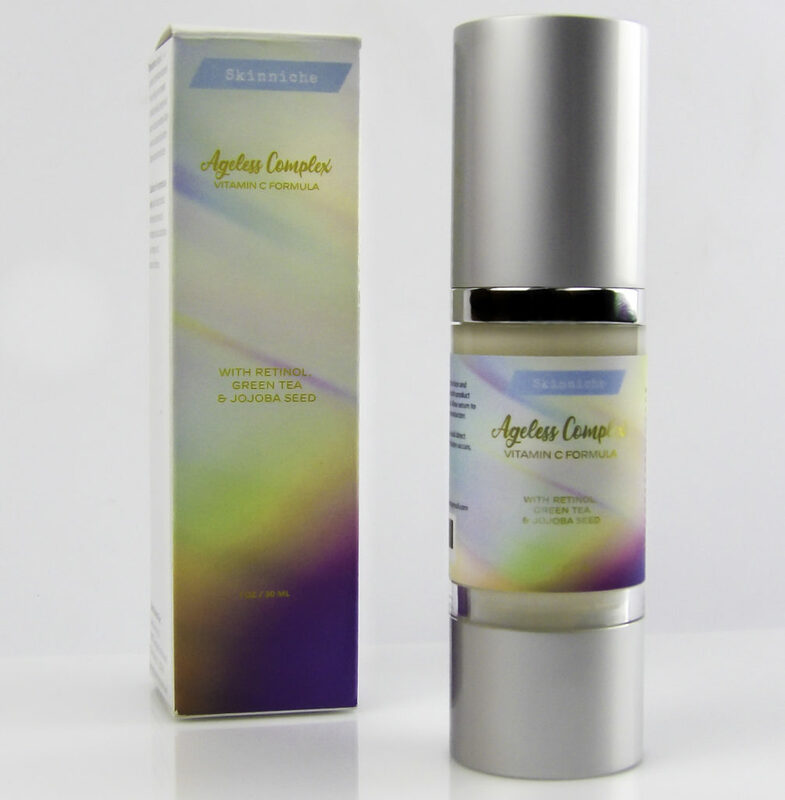 Reduced collagen results in sagging, enlarged pores, wrinkles, and skin dullness. Skinniche Ageless Complex Vitamin C Formula combines soothing ingredients like Jojoba and Green Tea with peptides and synergistic ingredients that maximize the collagen production capability of Vitamin C. The result is an effective serum that even sensitive skin can tolerate. 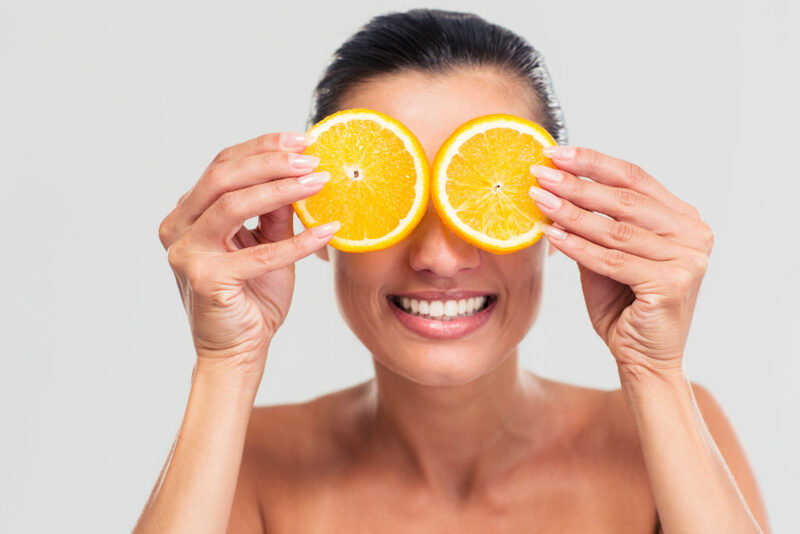 To get the most out of a Vitamin C serum, select a serum with synergistic ingredients that can maximize the efficacy of the Vitamin C.
What makes Skinniche Ageless Complex Vitamin C Formula so special? ANTI-AGING, DAMAGE REVERSING PEPTIDES: Amongst the synergistic ingredients in Skinniche Ageless Complex Vitamin C Formula are powerful peptides that each increase collagen production in a specific way. These ingredients are effective even on more mature skin with issues like deep wrinkles and sagging. One of these is Tripeptide-10 Citrulline, a relatively new ingredient in skin care that acts like decorin. 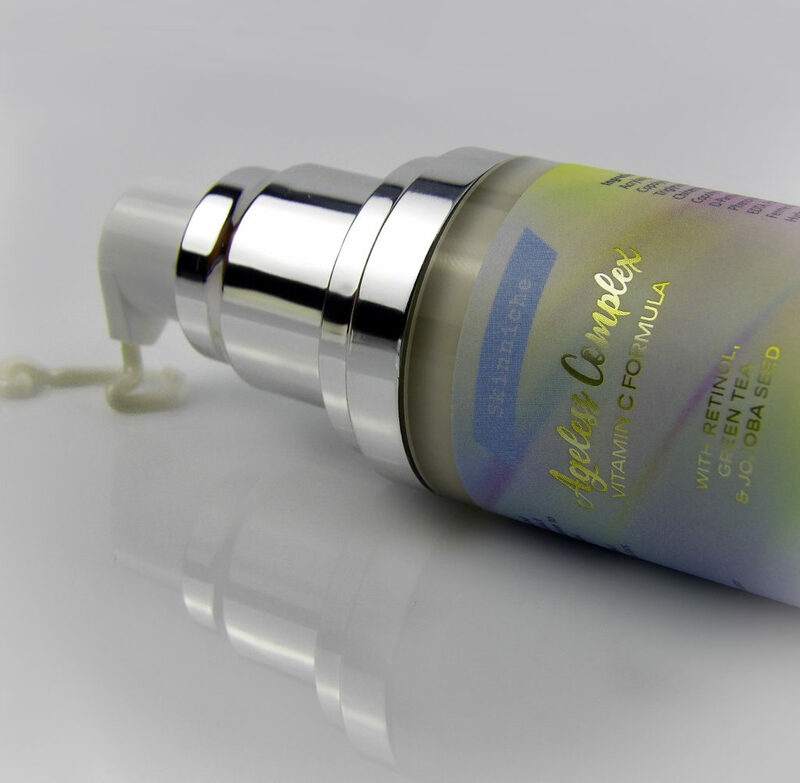 Decorin is found in younger skin, it prompts active collagen production. Decorin decreases as we age. Tripeptide-10 Citrulline mimics decorin, which in turn, fools collagen fibers into thinking they should still be producing at the rate they did in their younger prime. 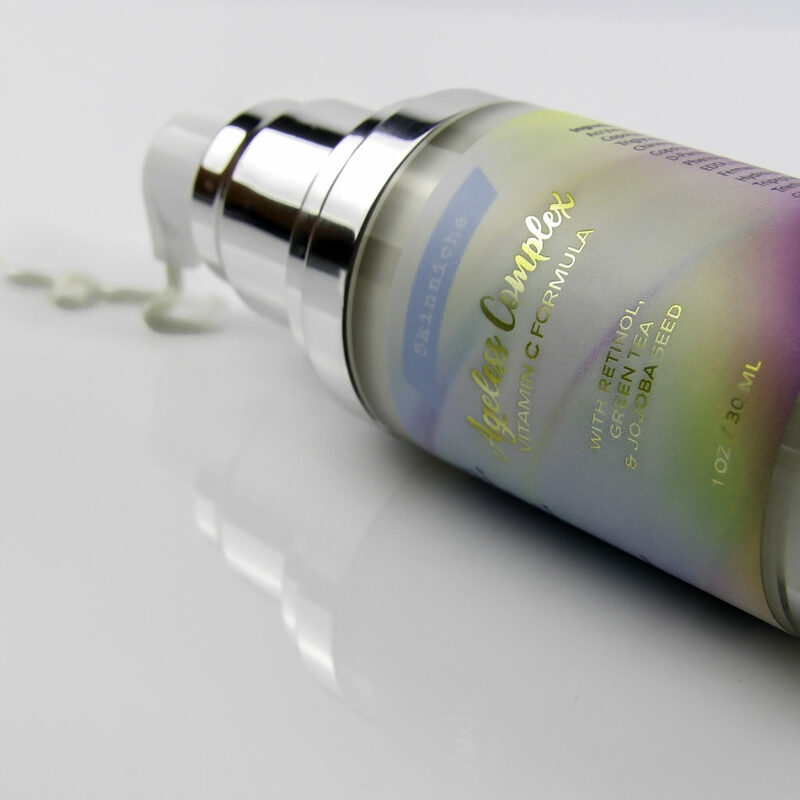 Clinical studies show how helpful these peptides are in reversing the signs of aging. A third peptide is Pseudoalteromonas Ferment Extract. It regenerates skin by retaining moisture, healing wounds, and increasing collagen and elastin production. Thiotain, a powerful antioxidant that recycles the power of Vitamin C, keeping it working longer on the skin. Vitamin E, a skin softening anti-oxidant that works synergistically with Vitamin C in collagen formation. Retinol works hand in hand with Vitamin C to break up discoloration, reduce the appearance of wrinkles, and increase dead skin cell turnover, resulting in smoother, younger-looking skin. It also helps with collagen production. Moisturizing agents including Jojoba Oil and Green Tea provide a soothing buffer, reducing inflammation and irritation, as well as keeping skin soft and dewy. Glucare-S is a third anti-inflammatory ingredient that soothes skin and enhances the skin’s natural repair process. 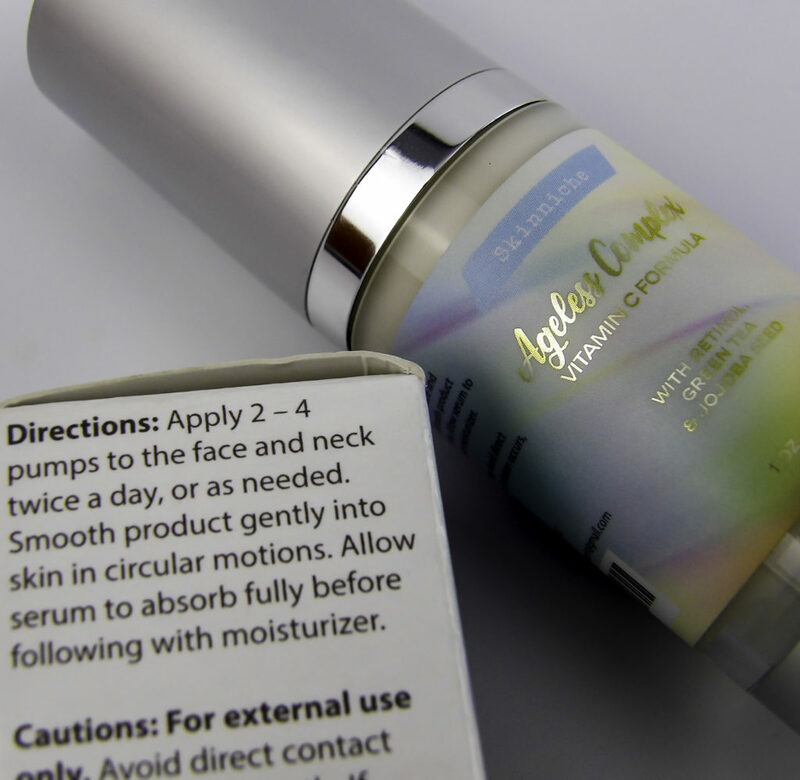 The airless pump keeps the product fresh, which is important with a Vitamin C serum. It is a one-ounce container that will last more than long enough to start seeing results. 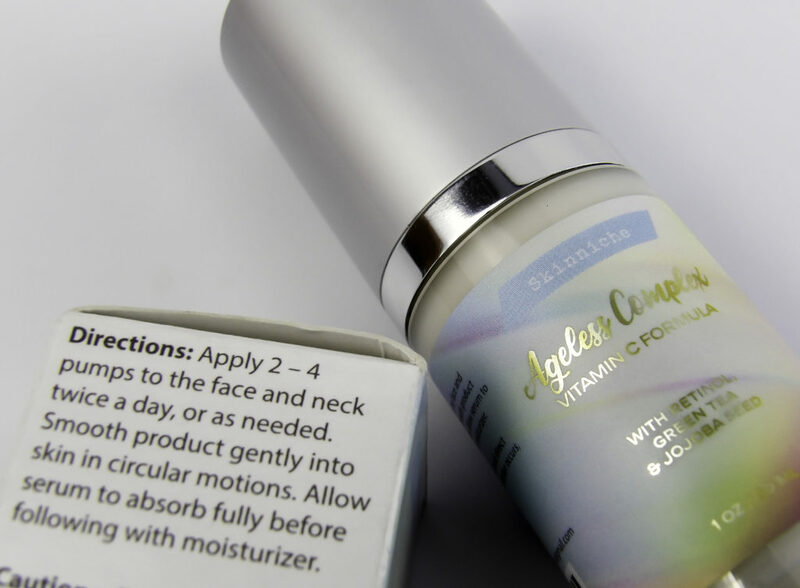 One or two pumps worth of Skinniche Ageless Complex Vitamin C Formula covers my face and eye area, and I use three or four pumps for my face and throat and collarbone area. I applied evenly to just-washed skin and allow the serum to dry before applying sunscreen or moisturizer. It dries down without being sticky, tacky or greasy. It does not make my skin feel tight and it does not leave a filmy or white residue. It does not sting and feels mildly cooling during application and until dry-down. 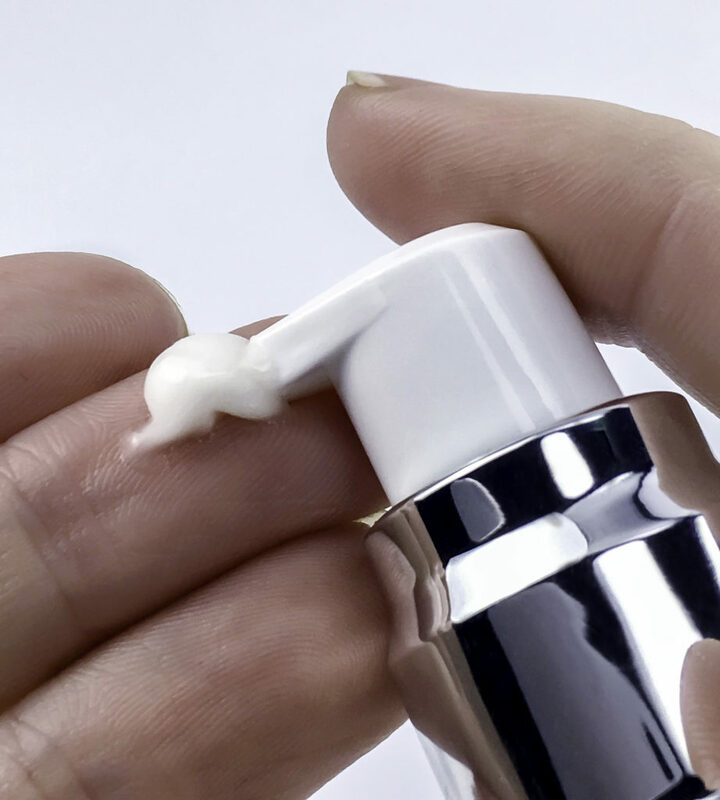 Moisturizer, sunscreen, and makeup can be applied over the serum without experiencing gumminess or pilling. I really like the dewy skin look I get with this formula even from the first few uses. And my skin feels so soft! 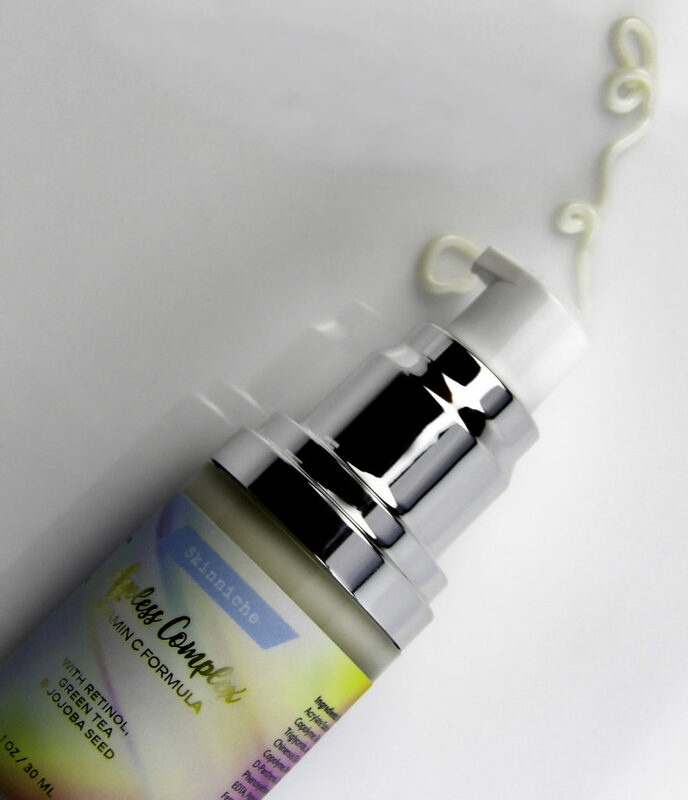 Despite the number of powerful active ingredients, the formula was very gentle on my sensitive skin, so I could tolerate daily use. 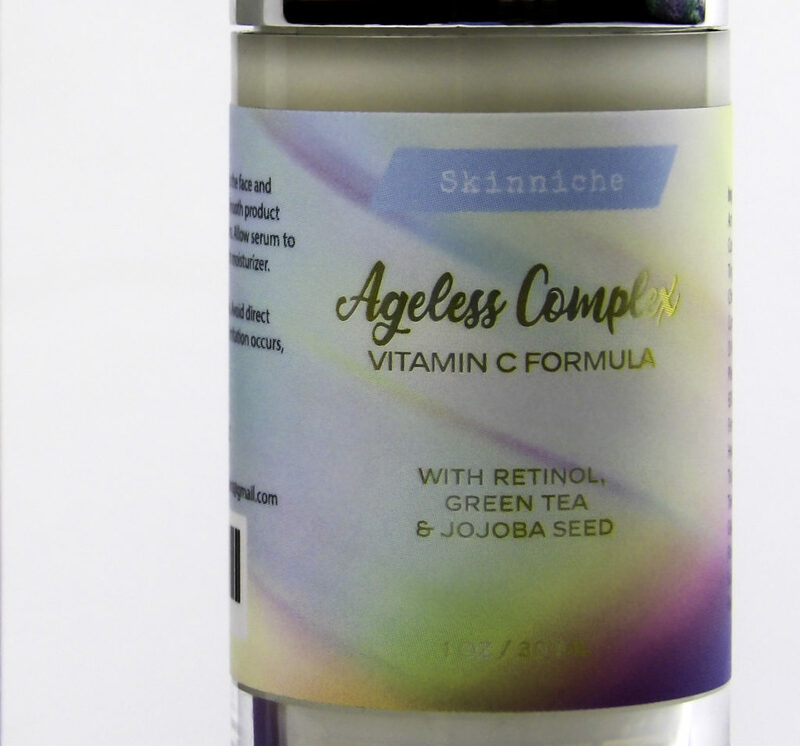 I’ve been using Skinniche Ageless Complex Vitamin C Formula daily for three weeks now, and I started to see results in skin hydration quickly, so my skin looked dewy, and my skin felt soft and smooth. Fine lines looked less severe and some discoloration is beginning to break up and fade. I am pleased with the results so far considering it has only been a few weeks. 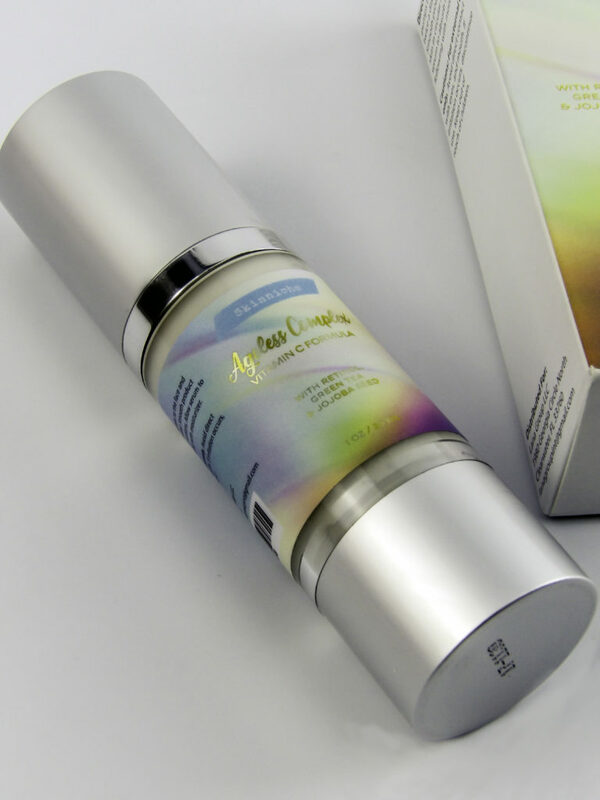 Skinniche Ageless Complex Vitamin C Formula is ideal for skin over 40 that has experienced a decrease in collagen. Signs of a loss of collagen include enlarged pores, deep wrinkles, and sagging. These occur in the deeper level of the skin and take about 2-3 months to begin to see visible improvement. This is because it takes some time for the increased production of collagen to be produced and properly “refill” these collagen fiber gaps. Once they do, it results in a meaningful effect on the “architecture” of the skin. In the meantime, dullness and fine lines improve quickly, as does the level of skin moisture, which overall, gives skin a much healthier, vibrant, youthful glow. Use the serum at least once a day, but twice a day, in the morning and evening, will produce even faster results. Skinniche Ageless Complex Vitamin C Formula has a host of effective, active ingredients that are typically found in far more expensive formulations, Skinniche Ageless Complex Vitamin C Formula combines the power of peptides, Vitamin C, Retinol, Jojoba, Green Tea, Vitamin E, and other skin-supporting ingredients to quickly reduce visible signs of aging including dullness, wrinkles, fine lines, discoloration, sun damage, and even scars and acne. Suitable for daily use without irritation even on sensitive skin, Skinniche Ageless Complex Vitamin C Formula is highly effective, especially for the excellent price point. Clinical, Cosmetic, and Investigational Dermatology, November 2016, pages 411-419. Style Chicks received Skinniche Ageless Complex Vitamin C Formula for review purposes and received compensation for our time and effort. However, our experience with the product and the opinions expressed in this review are 100% ours.